This workshop is 9 hours. 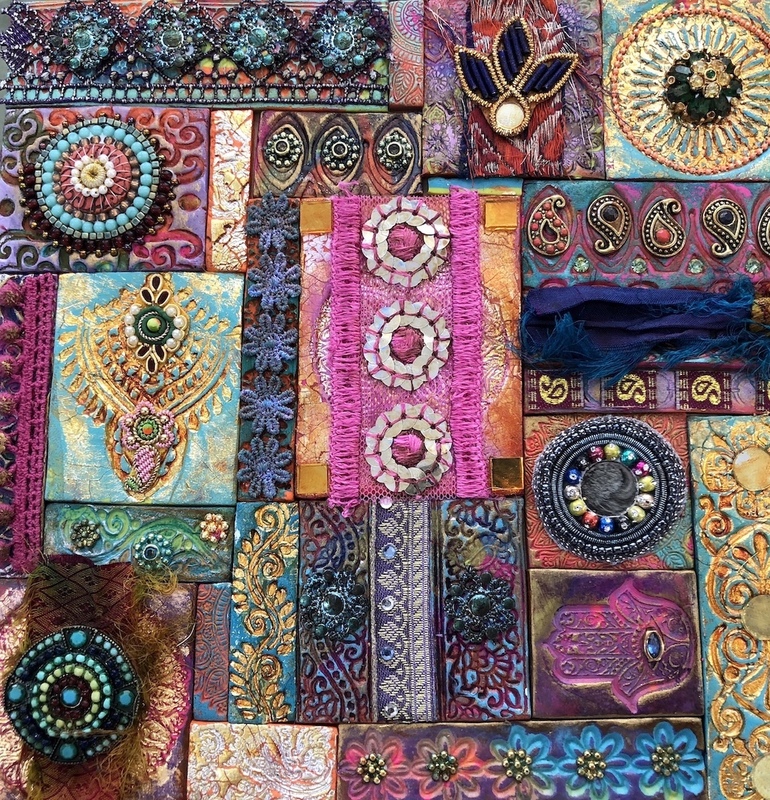 BoHo Clay Tapestry is a class where students will be guided through the process of using polymer clay as a background material on which to embed and attach glass tesserae, jewelry pieces, beads and fiber. 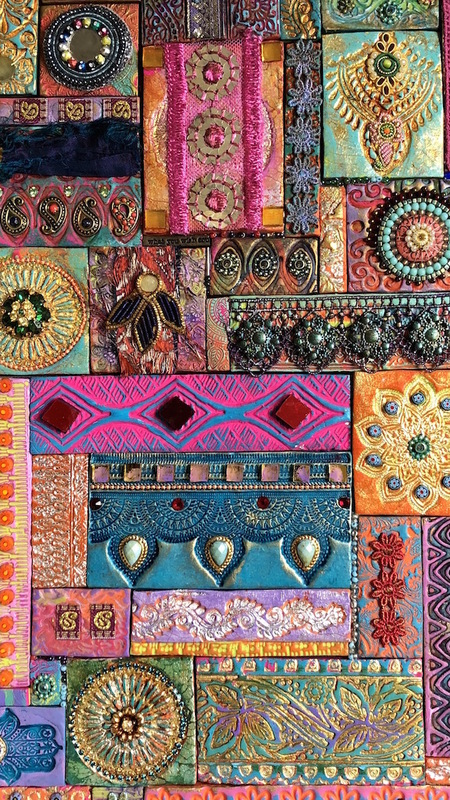 The goal of this workshop is to familiarize students with the medium of polymer clay and how it can be utilized to create tiles that can be combined with traditional mosaic materials to create beautiful works of art. In this hands-on workshop, students will learn how to condition clay, roll out slabs, rubber stamp, paint, gold leaf and embed the clay with tesserae. A variety of mixed media techniques for altering the substrate will also be emphasized including rubber stamping with ink and using stencils. 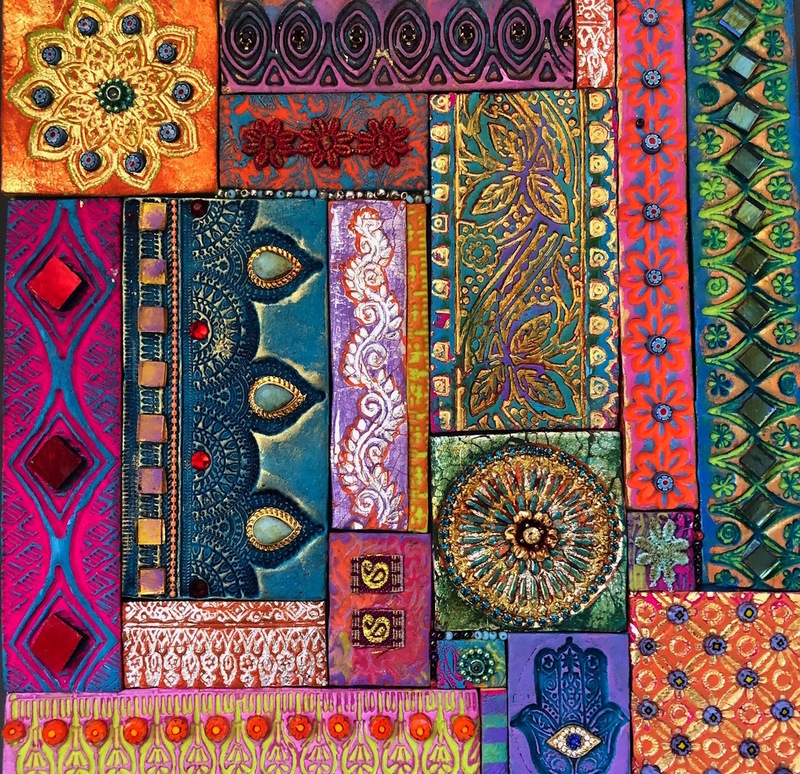 Students will leave class with a sumptuous, Bohemian-looking art piece ready to hang on the wall. 5 (2 ounce) packages of Premo or Premo Souffle polymer clay. A variety of bright colors. Make sure the clay is somewhat soft to the touch before buying, if it feels rock hard, don't buy it! You should be able to dent the clay in. Please condition clay prior to class by kneading the clay and rolling it into a ball. Place clay in a baggie to store. Rolling Pin or even a piece of 1.5 inch PVC pipe about 10 inches long. Doo-Dads-, tiny millefiori, small glass tesserae, jewelry parts, small fiber scraps/trim pieces, rhinestones, rhinestone chain, ball chain, metal findings, bead caps, buttons, beads, charms, small glass pearls, tiny mirrors (see pics for ideas). Stay away from plastic/ adhesive rhinestones.